The Sunny Health & Fitness Belt Drive Indoor Cycling Bike is one of the most highly rated and popular spin bikes. But why is that? Our review looks at this affordable bike with a simple uncluttered design that delivers on high quality features you normally only see in bikes that cost over $1000. This is a low priced bike with a heavy flywheel and stable frame. It comes with a belt drive for a quiet, smooth ride. The seat is fully adjustable up and down, forward and aft, and the handlebars can be adjusted up and down so as to fit many different sizes of people. The resistance is manually adjusted using a knobthat you turn to increase and decrease it. It is not feature rich like some bikes but it seems to give a very good cycling experience for many types of people – including spinners, outdoor cyclists, beginners and more experienced exercisers. This bike has a heavy flywheel at 49 lbs which is similar to the ones you usually only find in more expensive bikes. It gives a very smooth ride and you get the feel of riding a bike on the road. There is no choppiness like you get with lighter flywheels. The heavier flywheel means that it takes more effort to get the wheel turning and it takes more to slow it down than it would take with a lighter wheel, making it a good option for beginners and more experienced spinners. But the pedals and wheels continue to spin at the same speed no matter where you are on your stroke like you find when cycling outdoors. With a lighter flywheel this becomes more of a problem the faster and harder you are pushing as your feet move from pushing hard down to slowing across the bottom and top of the stroke giving an unnatural and distracting feel. This is smoothed out with heavy flywheels and you get a fluid ride more like riding an outdoor bike letting you concentrate on your workout. The flywheel does mean that the bike is heavier overall which could make it difficult to move however it comes with transport wheels that make this not a problem. The handlebars and seat are secured in tight and don’t move around while you are cycling There is no noticeable wobble from the bike when you are standing on the bike pedals or transitioning from seated to standing. It gives a good solid ride so you can just get on with your workout. The bike holds up well to being heavily used over long periods of time based on the experience of real users where users have worked out 3 or more times a week without seeing any change in its sturdiness and stability. If you have an uneven floor you can adjust the feet under the base to level out the bike and stop any rocking from side to side. Getting a bike to be properly sized for you is important to help ensure you get the best possible exercise and don’t get injured from bad form. This bike gives you the opportunity to adjust the height of the handlebars and the seat. You can also move the seat forward and aback to adjust to different heights. The adjustments can be done quickly by turning the knobs and moving the adjustment post. The ease of making these changes means it is possible for people of different heights to adjust it without any trouble – so you should only need the one for your household. This bike is suitable for people between 5 ft 3 inches and 6ft 8 inches from user feedback. It seems with the lower limit that there might be some scope for people shorter than this to use it as some shorter people seem to be okay without having to make an alteration to the seat adjustment post. But most who do use it under 5 ft 3 inches drill holes in the post so it fits their size from seat to pedal so as to avoid stretching to reach the down pedal. The handlebars can’t be moved horizontally and this lack of adjustment can make the bike too long for people with a shorter torso especially those below 5 foot 3 inches in height. It means you may be overstretching. The resistance is provided by a felt brake on the top of the flywheel. You increase or decrease the level of resistance by turning a knob on the frame. It is a manual screw type that gives reliable resistance. If you have used a spin bike in the gym you may find that you have to turn the knob further than the ones you are used to in the gym to get the same amount of resistance. The resistance does increase little by little so you can set it easily to the amount you want – there is none of the jumping from easy to hard you sometimes get with other bikes. The resistance is on a continuous scale and that means there are no fixed levels that you can set. Aagain this similar to the bikes you can find in a gym. It does make it difficult to be able to set the resistance to the same amount as you had on a previous workout, though, if someone has changed it since you last worked out. When you want the bike to stop, you press the resistance knob downwards and then the resistance pad works like a brake to stop the flywheel. If you don’t do this the flywheel and pedals will continue to turn from the momentum built up from your cycling. As this bike is using friction to provide the resistance the pads will wear out and need to be replaced periodically. This is a simple process. The pads can be bought by contacting Sunny, they can also provide help if you need it. The bike has a belt-type drive. This gives a quieter experience than the alternative chain drive you can get on spin bike. The belt is tight and there is no slipping so you get a good smooth ride. As well as being quieter than a chain, there is less maintenance with a belt drive and it should last for a good number of years before needing replacing. There is no need to lubricate it or tighten it as there is with a chain drive. You may find it has less of an outdoor bike feel than you would get with a chain drive. The pedals can take the pressure of users standing up and pushing hard. They are screwed into a strong crank shaft and feel solid beneath you as you workout. The pedals come just with toe cups and an adjustable strap. The cup size is small and can’t be adjusted and can seem tight for some people. The pedals are easy to replace which many people do. The bike is sized to take outdoor bike pedals with 9/16 thread. Also you have to do this if you want clip-on pedals. The Q-factor of the pedals is 7 1/2 inches – this is the distance measured horizontally between the pedal crank shafts. The closer the pedal shafts are the more economical and efficient is the cycling and generally there is less stress put on the legs, but the ideal distance for this does depend on the person. The 71/2 inches on this bike is towards the longer end of the spectrum for q-factor on spin bikes and for most people it won’t be a problem but it may seem wide for keen outdoor cyclists. I’ll start with the number one negative with the bike. The seat. It is hard and uncomfortable and I think if you took a poll of customers you’d find nearly 100% agreement on this fact. Most people swap the seat for a more comfortable bike seat or get a gel cover for it. It takes a standard bike seat and requires only a little work to achieve the swap. There are some hardy people who adjust the seat to find the most comfortable position and then persevere with the seat and say they do get used to it after a few rides. Bike seat comfort is an individual preference. So most people would find any seat uncomfortable and would want to change it anyway. By providing the seat the manufacturer does, it is helping to keep costs down for the bike for an item that many people will probably want to change anyway. Now on to something more positive. The Sunny Health & Fitness Belt Drive Indoor Cycling Bike is very quiet. Having a belt drive there is little noise when you are cycling like you can get from a chain drive. You also get some noise from the resistance pad on the top of the wheel as it uses friction to apply the resistance but this is quiet. People have ridden the bike in the middle of the night and not disturbed others in the house. It also seems people don’t notice the bike being used when they are sitting downstairs with open doors so this bike could be a good option for use in an apartment and would not disturb your neighbors as you might do with a treadmill. The resistance pads can squeak sometimes and this can be easily remedied with silicone oil applied to the pad. The ride itself is smooth and stable like you get from the high end models you find in gyms. It gives you a great ride whether you are taking it easy or pushing hard up the hills with no wobble at all. The bike does give off dust particles and lubricant may drop so a rubber mat is a good idea for protecting your floor. The handlebars are padded for comfort and you don’t lose your grip because of sweat or get blisters. The design of handlebars allows you to place your hands in the centre when sitting down or at shoulder width. When standing you can brace yourself either with your hands shoulder width apart or at the ends of the bars. You can also lean on the handlebars if you want when out of the saddle and be cushioned by the padding. The bike is fairly compact and doesn’t take up much space. The dimensions are 50 (H) by 20 (W) by 44 (D) so it can fit easily into a corner out of the way or in a cupboard or under the stairs. If you want to store it out of the way you can use the transport wheels at the front of the bike to move it there. Although the bike is heavy (115 lbs), the way the bike is weighted with the flywheel at the front it doesn’t take much effort at all to tip the bike forward on to the transport wheels and then to move it to where you want to store it out of the way or vice versa to move it to where you want to do your workout. The bike comes mostly assembled with just a few parts to add to it to get it up and running. This takes about 30 to 60 minutes to complete. The instructions are well laid out and are easy to follow. Many people complete the assembly without referring to the instructions. It involves adding the seat posts, pedals, handlebars and feet to the bike. All the tools required to complete the assembly are included. The biggest problem is the weight as the bike plus packaging weighs 126 lbs when delivered. This can make it difficult to move around while putting it together and moving it before it is assembled. It may need two of you to manage the weight. Once assembled you can use the transport wheels to easily move it around. The bike does not come with a console. You can still get a great workout without it by following your own workout plan or following along to a DVD. If you do want to track your data to know the equivalent miles cycled, timer, speed etc you can fit a console for a bike like the CatEye Strada Wireless Bicycle Computer which costs about $60 as other customers have (as mentioned in their reviews). There is just the one accessory for this bike and it comes with it attached. It is a metal water bottle holder on the side of the right fork. It has some tension in it to hold your bottle in place while you are riding. However,it is in a bit of an awkward place to get to while you are riding and you may find yourself stretching a bit to get to it. Sunny doesn’t seem to like to add too much to their bikes and that probably helps with the price and means there is less to go wrong with the bike by keeping it simple. When going through the reviews online you quickly see this is a highly regarded bike. There are only a few negative ones to be seen. The negative ones discuss the problems with delivery and the warranty and not the product itself. Those that have the product are very happy with the product even with the terrible seat and the lack of add on features such as a computer, heart rate monitor etc. They like the way it feels when they’re riding with it giving a stable and smooth ride, that it stands up well to a lot of use and it is at a very good price. This is a well priced product and it is discounted on Amazon from time to time. Bikes with a heavy flywheel like you get with this bike can cost up to $1200 more than you pay for this bike. It doesn’t have a lot of features but what it does do it does very well – giving you a bike you can get busy working out on – getting and staying fit and burning calories while staying in the comfort of your home avoiding the snow and bad weather or saving the trip to the gym. There are some minor issues with this bike. The lack of features, the continuous resistance where you can’t see levels (any issue with most spin bikes), no console to gather data on your rides, a very uncomfortable seat and pedals that don’t take clip-on shoes. These are points to beware of and most people take these into account, buy the bike and make any changes they want and are very pleased with their purchase. What you do get for a very good price are features you normally see in much more expensive bikes. Namely a strong frame, a heavy flywheel, adjustable seat and handlebars. This all gives you a very stable and sturdy bike so you get a very smooth ride letting you concentrate on getting a great workout. 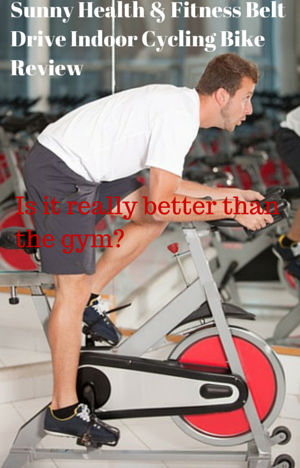 It is a good spin bike for both beginners and more experienced cyclists to get a full workout. The price of the bike makes it a great deal for such a well regarded bike. You mention that a console can be bought and added afterwards. What console would you recommend? Would it give just cadence or speed, distance, time, etc? Thanks. The console that has been frequently bought and used is the CatEye Strada Cadence Bike Computer. You do need to alter the spoke magnet to fit on the flywheel. It is a good affordable option. It measures Current / Average / Max Speed, Trip Distance/ Elapsed Time/ Odometer/ Clock. Any chance of a review for the Sunny Health & Fitness SF-B1423 Belt Drive Indoor Cycling Bike? This has an computer that tracks stats and also belt driven. I am looking to get a spin bike for the first time and want to make a good decision. Thanks! Yes. I’ll do one soon. I’m just a bit backed up at the moment. It looks like another good bike from Sunny Health. It has a lighter flywheel at 40 lbs but that should still give a good fluid pedaling motion. (This compares to this model having a 49 lbs flywheel.) It cetainly lools like it would be good for a good model for beginners. I’m trying to figure this out also – so the main difference is the flywheel weight? Thank you for an amazing website! Yes it is a main difference between the bikes. If I am 5ft will this bike work for me? I don’t think so as it is best for people over 5ft 3ins. Those who use it below the bike have drilled holes into the seat post. Thanks for your review! It’s very helpful. You’re welcome. Great to hear it helped you.